Scanspeak R3004/662000 Illuminator Tweeter, a no-compromise member of the superb Illuminator Range. Stunning design with superb vocal rendition and excellent imaging. 6 mounting holes. 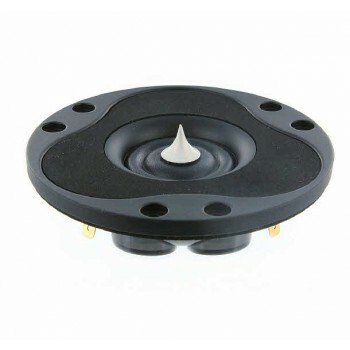 Black die-cast rubber painted aluminum face plate, Diffraction Damping Rubber Front, 1" Ring Dome Diaphragm, large roll surround, 26mm vc, all for wide dispersion. Low Fs, rear chamber design that eliminates reflections and resonances. This tweeter features the Air-Circ “SD-2" Neodymium 6 magnet symmetric drive motor system. Excellent wide dispersion from the large roll surround. Fully comparable both in sound output and quality to the Revelator ranges.